Rapper Ice-T recently made some amusing comments on a podcast about an unexpected D&D-related audio book recording he was set up to make. Reading his comments me original thoughts were that it was sad he was dumping on fantasy, role-playing-derived or otherwise based on what appeared to be stereotypes and the worst the genre has to offer. Now I see where he was coming from in his vulgarity-strewn phrases about “******* talking like Yoda” and “******* pegasi”. Up until this volume I have really enjoyed “The Sundering” series of Forgotten Realms novels. The opening one had been the weakest I felt, but still enjoyable due to my familiarity with Salvatore’s characters. The novels that followed impressed me, and I’ve found a few new authors and series within this shared world to check out. Each book was unique, but provided a solid perspective on these events within the Forgotten Realms. But “The Herald”, well I struggle to find anything positive to say about it whatsoever. Until this series I’ve only read Salvatore, and only his earlier novels. 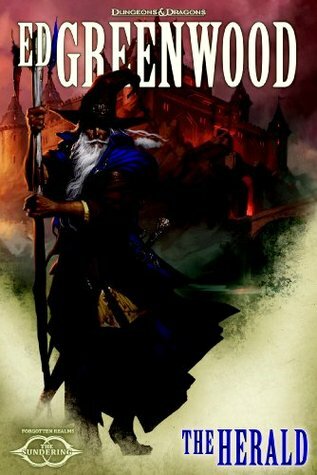 I’d heard of Greenwood’s character Elminster in name alone. While most of the other “Sundering” novels provided decent background to become familiar with their characters, “The Herald” provides almost none. And it is a huge, ever-shifting cast. The layout of the electronic copy probably didn’t help, where breaks between characters and points of view were not always obvious. This formatting issue of an advanced reading copy happened with earlier “Sundering” novels though and wasn’t nearly as problematic. “The Herald” is just simply a mess. Having read it closely I still have little idea who the various characters are other than superficially. Some I could only figure out by using online resources. There is a good amount of action, but little time is spent getting to know any of the characters, you are just expected to know already I assume. Beyond the difficulties of trying to figure out who everyone is, there is also the matter of trying to figure out what is going on. I got bits and pieces, and a generic sense of good fighting evil, but other than that, nothing. As Ice-T implied (even if he wasn’t talking about “The Herald”, his words certainly hold true), the writing is simply hard to slog through in many spots, filled with archaic style and grammar and an abundance of universe-specific vocabulary that unless you are a gamer or familiar with this, will go right over your head. Others effectively use context to help impart comprehension to the uninitiated. As the designer of Forgotten Realms, I guess Greenwood can’t bother with this. Elminster frequently switches back and forth from old English ‘thou’s to a modern ‘you’ with no apparent logic. I assume that if you are a big fan of this universe and know all the Elminster novels you’ll read this no matter what. But for those like me who may read more casually, or how are looking to enter into this universe, go elsewhere, like some of the earlier “Sundering” novels. Although a series, thankfully these don’t all have to be read. Me, I’ll return to catching up with the adventures of Drizzt and discovering the other works by Dennings, Kemp, and particularly Evans.